Premium Tempered glass screen protector is specially designed for Sony Xperia XA1 Smartphone. Perfect Anti-scratch: The surface of the Sony Xperia XA1 Screen Protector Tempered glass has a hardness of 9H, three times stronger than regular PET film. Even sharp objects like knives, keys and some other hard substances will not scratch it. High-response & high-transparency: Only 0.3mm thick + 99.99% light penetration ratio, preserves the original viewing quality and maintains the original touch experience for Sony Xperia XA1. Bubble-free adhesives for easy installation and no residue when removed. Tips: The debris must be removed completely before installation, then direct the hole, place the screen it will auto to apply on the screen (don't need to press). RBEIK, A Quality Product Within Your Reach! - The Sony Xperia XA1 screen protector does not match your model. - The Sony Xperia XA1 screen protector damaged in the process of transit. - The Sony Xperia XA1 screen protector broken during normal use (not including damage caused by abnormal use). 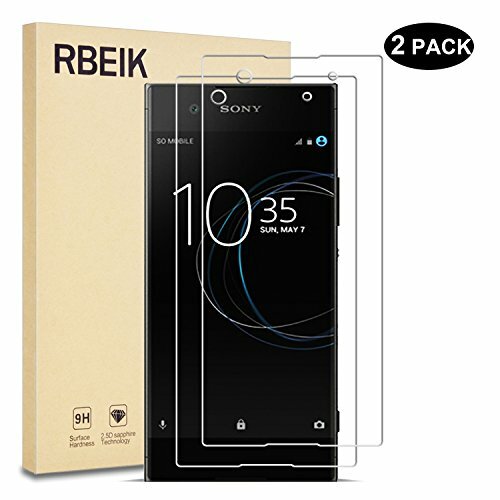 This product Sony Xperia XA1 Screen Protector is sold exclusively by RBEIK. Only buy from RBEIK to get genuine RBEIK products with manufacturer warranty and super customer service.